I had heard of John Buchan’s novels in my history studies, and Greenmantle was one of the required reading selections in a high school Modernity course taught by one of my favorite instructors at Franklin Classical School in Tennessee (by the way, get your children out of the state schools at any cost. They will be indoctrinated into mushy-minded statism, not taught to think or love learning.) Greenmantle was second in a series of five novels featuring the chief protagonist, Richard Hannay, so I had to read the first one first. 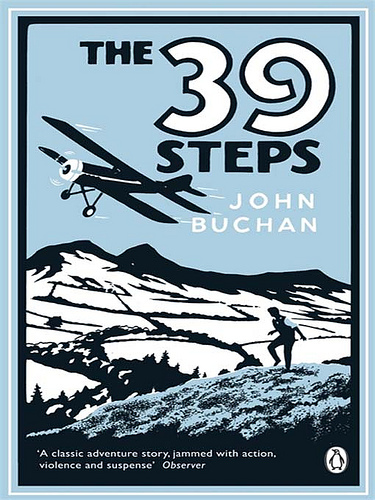 The Thirty Nine Steps is that first novel. Buchan was a Scottish author who lived between 1875 and 1940. According to Wikipedia, he was the 1st Baron Tweedsmuir, a novelist, historian and Unionist politician and the Governor General of Canada. His stories are action-packed and not at all lowbrow. The Thirty Nine Steps is set in the months before WWI, this story is among the great spy-mysteries that helped establish the espionage/action genre. The story is established by the curious intrusion of a desperate man into Hannay’s home. Mr. Scudder, the tale-bearing intruder, carries a notebook of encoded secrets, and proceeds to hastily explain his intrusion with outlandish tales of international intrigue. Apparently, the information Scudder possesses has critical bearing upon the upcoming war. Over the coming days, Scudder’s take gets the gears turning in Hannay’s mind, but it is the unexpected murder of Scudder in the protagonist’s apartment by, apparently, German agents, that convinces Hannay to take up the now-dead man’s cause. This sends him upon a fantastic mission to get the notebook of cryptic codes to the proper authorities. Having been complaining about the boredom of London compared to his former Rhodesian life, and desiring some exciting change, Hannay gets what he has desired. Now the chief suspect for a murder, and wanted by a mysterious German spy ring, Hannay must flee. His adventures take him through Scotland, on rail, foot and by car, through woods, moors and political rallies, inns and storehouses, and past the door of death several times as he tries to decipher the code, find trustworthy allies, and aid the national good. The suspense is thick and engaging. I was hooked by the first chapter. 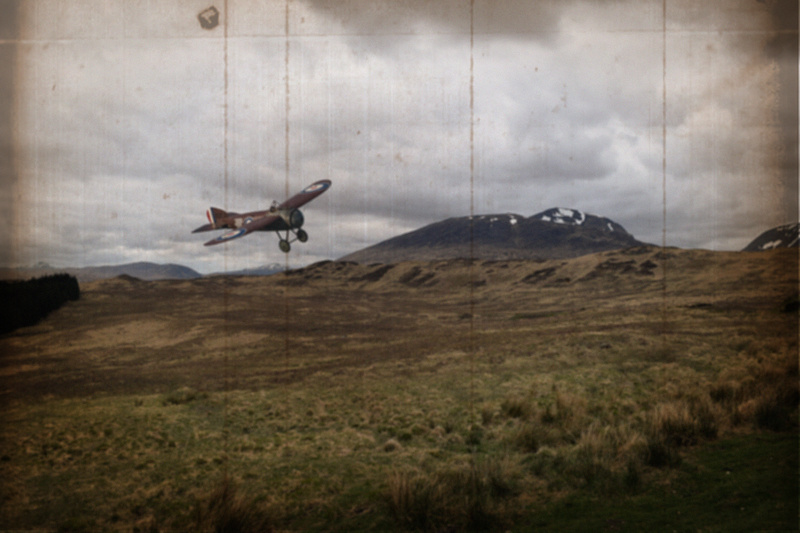 The moors of Scotland and a monoplane factor into the tale. Bugs me when all the images are of a biplane. It was a MONO plane… heh. So I made my own image. For the average American reader, the book is peppered with place-names, people, and historical references that are challenging to grasp. An edition with plenty of footnotes or end notes is helpful. Add to that the vocabulary of more-educated times, and the use of Scottish dialect among the earthier folk, and the book can make an enjoyable challenge. As a first of its genre, this is a good introduction to the espionage cat-and-mouse game as we follow Hannay through moors and streets, pursued by rough men bent on danger. The tale is gripping to the very end; and historically, the settings, events, attitudes and times are well attested. Never mind the various film and television adaptations, none of them follow the book closely, even Hitchcock’s classic. They find it necessary, inexplicably, to modify the plot. The most recent adaptation, a 2008 BBC film, added an entire main character – a woman – and she actually was the wit and bravado of the adventure. As enjoyable a film it was, it completely robbed the novel of its soul. The Thirty Nine Steps is important in its place at the front of its genre, but its just a fun red as well. Strongly recommended.